Starting from Thursday, all eight boats and two dry-cargo vessels have been under all-day-round protection by passengers, who replace each other on duty every three hours. The voluntary duty watch is three hours, and there are more volunteers than watch posts, at least on the boat where I’m accredited. The reason for doing this was an act of sabotage on the Irish boat. Paul Murphy, Member of the European Parliament from Ireland arrived on the island and told us the details. According to him, mechanics from the Irish boat found a part of the engine that had been cut with a saw. Murphy says the damage was intended to make the boat sink once it reached the open sea. The fleet’s organizers have asked all crews to protect their boats. My boat’s crew had established protection even before that as they were cautious of similar sabotage acts. 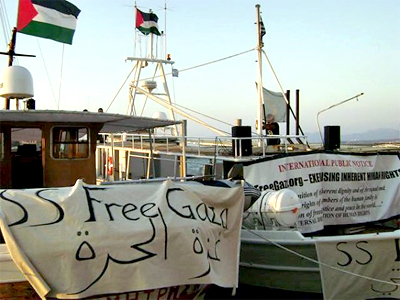 The Irish crew blames the Israelis for the damage as, according to them, there’s only one country that has been aggressively opposing the peaceful fleet aiming to break the five-year blockade on Gaza. According to Paul Murphy, this opinion was expressed at the conference in Athens, as well as in the interview with the fleet’s spokesmen. 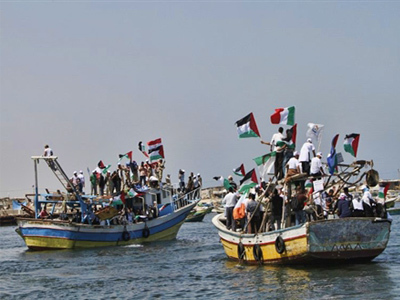 The Israeli media, against the opinion of the accredited Israeli journalists with the fleet, have been spreading the views of various Israeli security structures that the boats are carrying bags with gunpowder and so-called chemical weapons, which the fleet is allegedly planning to use in its attack on the Israeli army. Yesterday passengers and journalists on my boat inspected the vessel, and did not find any bags or suspicious mixtures onboard. Passengers and journalists on other vessels informed each other that nothing of that kind had been found on their boats either. 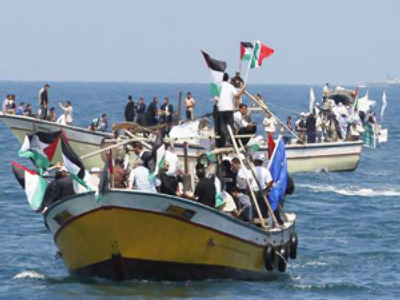 The fleet’s organizers have stated time and again that the fleet’s mission is to bring peace, rather than threat. 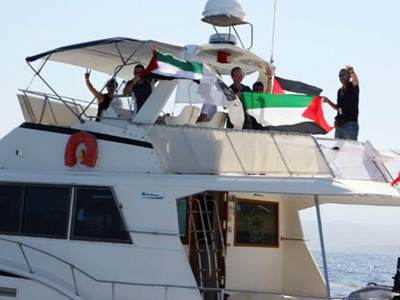 All participants on all boats have signed a declaration called “Stay Human”. Nobody, including the media, can be on board without signing it. 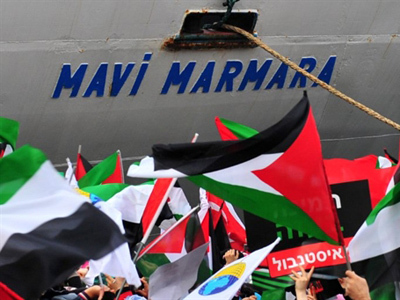 "I understand that I am obliged to follow these eight rules and general principles of non-violent resistance adopted by the Freedom Flotilla2. 8. Stop active protection when all ships have effectively been commandeered"
Today the peaceful statements were repeated, and so was the invitation for an independent commission to inspect the vessels. The state inspection of passengers and cargo has anyway exceeded all possible limits, according to the fleet’s organizers. 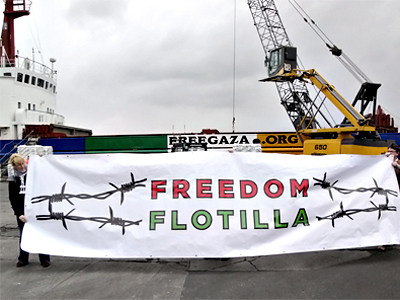 They are convinced that because of the procedures for getting paperwork and inspections, the fleet’s start has been postponed for a week, according to Dr. Arafat Madi from the organizing committee, Free Gaza. During our boat’s inspection, the assistant captain caught three rats in an empty hold. These were the only unwanted visitors onboard. The rats were photographed and their removal documented by those on duty on the boat. Police at the port where our boat is docked strongly advised the crew to increase the boat’s protection, and to coordinate their actions with them, as the island’s port and police do not want any more sabotage acts there. On board one of the ten boats, there are one parliament member, one parliamentary candidate, about two dozen journalists, a world-renowned Italian photographer, engineers, a skipper, a surgeon, three nurses, a teacher, an artist, a designer, a sociologist, and two historians. Many are in their 60s, and even 70s. 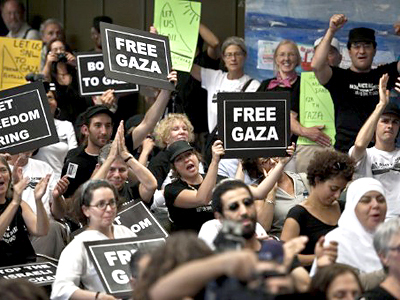 Most of them are pacifists, vegetarians, Catholics, Protestants, Jewish and Orthodox. On our boat, there are just a few Muslims. “Of course I don’t want to die,” a 27-year-old passenger, a son of Jewish Americans told me. “This is certainly very dangerous. 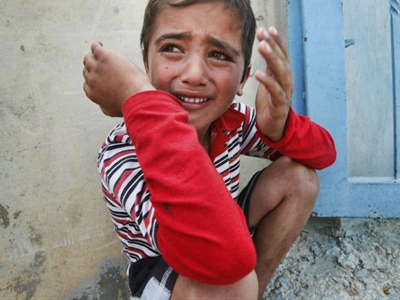 But Palestinians have been facing danger from the Israeli army from their birth to their death for 63 years. Some women die giving birth while waiting at checkpoints to be allowed to go to the hospital – and so do their babies. 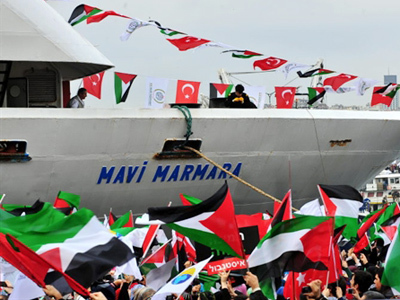 Therefore I hope to overcome my fears, which that are insignificant compared to what the Palestinians go through,”, says Marco Ramazzotti, one of the people on board. 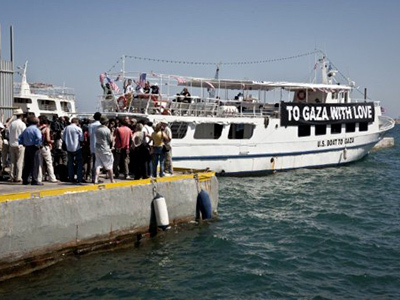 The fleet’s organizers keep the boats’ departure schedule, the lists of passengers and journalists, and other details confidential in order to avoid sabotage against the boats and people.